(GIN)—There were smiles all around in Kenya as French President Emmanuel Macron and Kenyan President Uhuru Kenyatta shook hands over a series of infrastructure deals worth $3.3 billion. 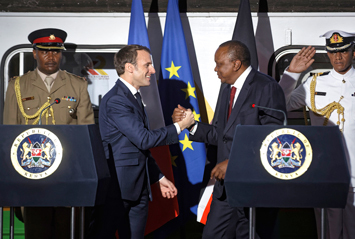 It was the third stop on the French president’s East African charm offensive—and the first-ever visit to Kenya by a French head of state. France wants trade and commercial relationships that are “fair and profitable for the Kenyan people,” Mr. Macron said. Alluding to Africa’s many relationships with China often freighted with debt, French investments would be respectful of the receiving country’s sovereignty and sustainable, he pledged. The railway, President Kenyatta said, “will help completely transform the lives of millions of urban workers.” It should be operational by 2021. The two leaders then shared a photo op seated in Mr. Uhuru’s new Peugeot 3008 SUV—assembled in Kenya. In 2017, French exports to Kenya, a former British colony, were about $200 million—about half Uganda’s exports to its neighbor. China exported $3.8 billion, making it Kenya’s biggest trading partner. Pro-government groups were unhappy with his references to the detention of opposition leader Maurice Kamto and 150 of his supporters and to the violence in the western Anglophone separatist regions. Other countries on Tibor Nagy’s itinerary were Uganda, the Democratic Republic of the Congo and Rwanda. Coincidentally, the official visits come as both French and American governments are under fire at home over the erosion of civil liberties, income inequality, racism and the rise of White nationalism and neo-Nazism.